Kevin Przytula planned to propose to his girlfriend, Allyssa, over the weekend in Bay City, Michigan. 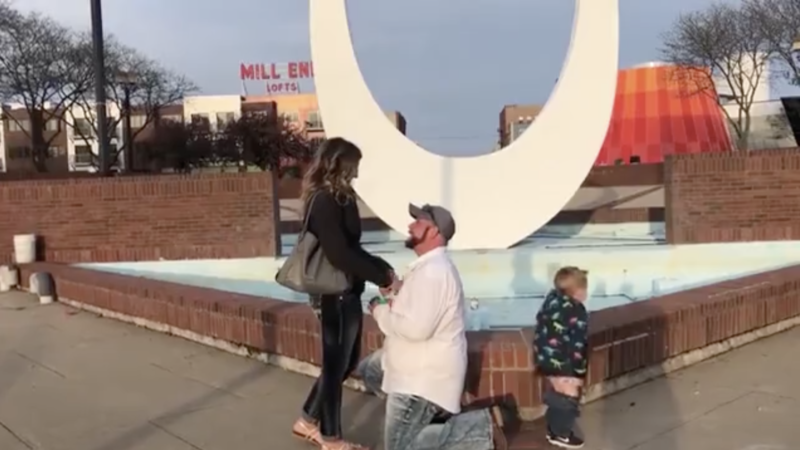 He brought her 3-year-old son Owen along, as well as a friend to film the moment as he popped the question. Przytula stopped his girlfriend in front of a fountain and romantically dropped down to one knee. Just as he pulled out the engagement ring, Owen dropped his pants. At the moment his mom became engaged, Owen was answering the call of nature. Przytula kept his gaze on Allyssa. "I love you with all my heart," he said, taking her hand and slipping the ring on. Allyssa said "yes" and gave him a kiss. All the while, Owen was letting loose behind the couple's back. The friend filming the proposal started giggling uncontrollably as Owen peed behind the couple, who were so focused on the engagement they had no idea he was stealing the show. "Oh my God. You guys?" the friend said through laughs. Finally, Przytula turned around and realized what Owen was up to. Przytula put the video on Facebook and says it got 56,000 views before it was taken down. It wasn't quite the reaction he was planning on, but the video has brought the family countless laughs.